As you go through the varied periods of your life, your levels of independence can take on different meanings. They can be larger stages, such as leaving your parents’ home or getting married, or smaller stages, like completing tasks you didn’t think you were able to do. Then as you age, independence takes on still another form – having the option to stay in your own home safely and securely. This desire to be at home can remain the greatest wish of many seniors, in spite of their condition of health or capacity to function independently, even in the midst of injury, illness and chronic conditions. For adult children, caregiving for aging parents at home can turn out to be rife with physical, emotional and social difficulties. Adult children often must increase their capacity as caregiver and become progressively active in the day-to-day responsibilities this critical role calls for, all while preserving a balance of independence. It’s easy to get caught up in the role of caregiver when the situation emerges—your parents have done so much for you that, when they reach a point in their lives when they need elder care, it’s natural for you to want to do all you can to see to it that they are taken care of. Nonetheless, it’s vital to bear in mind that, for most older individuals, retaining that independence was a key component in their wish to age at home. 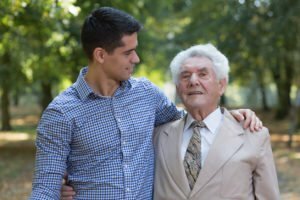 While your intentions may be well meaning, it can often be natural to go from caring for elderly parents to doing everything for them. And frequently, this well-meaning hands-on caregiving can have a detrimental effect on enhancing self-sufficiency and overall day-to-day freedom. As your parents’ caregiver, you should try to promote the independence of your loved ones, not do everything for them. Why is promoting independence in older individuals so significant? Being able to accomplish some tasks without assistance boosts future and continuing self-reliance—if they can do this, they can probably handle that! In these circumstances it’s worthwhile to put yourself in your aging parents’ shoes. How would you feel if there were things you could do, but weren’t permitted to because another individual had taken over? Encouraging your loved ones to do things for themselves offers a sense of purpose and can help them feel self-assured. By bringing in professional assistance from those who specialize in home care for seniors, you can help enhance your parents’ feelings of empowerment and ability to function successfully at home. Hired Hands Homecare, a Napa Valley home care company, can help you and your loved one when this need arises. Our talented staff in Napa County provides a broad range of elder care services in California, allowing your loved ones to focus on what they can do, and helping them with tasks they would rather not do or now have a hard time accomplishing. Our in-home care services include light housekeeping and meal preparation as well as general assistance with daily tasks. By allowing our staff to provide this type of care, both you and your parents can better work together to foster self-reliance, independence and an improved overall quality of life. Contact Hired Hands Homecare online or by phone at our Napa number, 707-265-6400, to learn more.